Ⓟ 2009, Blackstone Audio, Inc.
Dispatches is Michael Herr’s first-person account of his experience as a freelance journalist – embedded with various USMC units in Vietnam, 1967-68. It is, admittedly, an extremely difficult novel to get traction on as the opening passages seem wildly discursive. The trick is to let go of trying to parse out sentences or even whole paragraphs, and just roll with it as whole as the picture comes into focus. In many ways, Dispatches is like an Impressionist painting: best appreciated with some distance from the object rather than with intentness upon its component parts. What emerges from the writing is the inanity of The Vietnam War for all the high ideals propounded by Mission commanders. In many ways, the insensibility of the War is reflected in Herr’s rambling, at times near stream-of-consciousness, prose. The images coalesce into the run-up, action of, and the end of the three-and-a-half month Battle of Khe Sanh. As the North Vietnam Army (PAVN) feinted and eventually engaged at Khe Sanh, the Marine base there was besieged. The US committed all resources to operations at Khe Sanh, President Johnson mandating that the base be kept at all costs. Ultimately, the base was destroyed, the Marines pulled back and, the US claimed victory on the premise of casualty figures and the fact that PAVN forces withdrew suddenly afterward. PAVN forces also claimed victory, as after all, they destroyed the base and forced the Marines to evacuate. Dispatches questions the significance of the dual claims of victory and the sudden withdrawal of the North Vietnamese Army, especially in context of the Tet Offensive. Herr’s portrayals of the men who fought and reported in the war are the smaller brushstrokes that make up the bigger picture of that time and place. Herr talks and travels with Marines and other reporters, perhaps none more poignant and intriguing than that of his colleagues, Sean Flynn , Dana Stone and Tim Page. Flynn, Stone and Page were photojournalists who cut careless, romantic figures. They were each extremely intelligent, talented men whose ambitions and impulses exacted dear prices. Their legacies and fates are equally breathtaking. Ray Porter is the American narrator who reads Dispatches. The book is either the result of giving a typewriter to an inebriated soul and/or; drugs and alcohol to a journalist. Either way, managing the text and propelling it forward had to have been a challenge. Ray Porter met the challenge, framing the material in a natural voice without caving into a hyperbolic interpretation of extreme and intense situations. There may be a mispronunciation or two (“artillery” is pronounced as “artillerary” in one instance); but over all the delivery is on point. 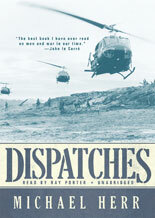 I borrowed a library CD copy of Dispatches (by Michael Herr; narrated by Ray Porter) from Blackstone Audio, Inc. I had no involvement in the production of Dispatches (by Michael Herr; narrated by Ray Porter.) I receive no monies, goods or services in exchange for reviewing the product and/or mentioning any of the persons or companies that are or may be implied in this post. Unfamiliar Fishes is the fun, smart and entertaining history of Hawaii, the focus being on the nineteenth century when New England missionaries came to the islands and introduced Christianity, literacy, infectious diseases and, Western ideas like democracy, entrepreneurship and, marginalization. The topics may be heavy; but Sarah Vowell’s wry style of delivery makes this a relatively digestible lesson in history that probably wasn’t covered in your classroom. Ms Vowell herself is funny and smart; but the novelty of having her narrate her own book wears thin after a little while. Because she includes personal memories or thoughts in the book, she is perhaps the best narrator for her own material; but her shuttered, neurotic clip and even a mispronunciation (“forecastle” should be pronounced “FŌK-sull”) may cause the listener to reflexively tune out as a defensive mechanism. The other voices listed as narrators occasionally pop in with a quote; but nothing substantive or consistent. Sometimes Sarah Vowell reads a quote, sometimes someone else. The celebrity guest roster of contributing narrators is impressive; but really no more than a gimmick and the intrusive edit-ins of their lines is disruptive to the listening experience, as is the music that signals the end of each chapter. Recommendation: Check out Sarah Vowell on the book trailers, on the late night show circuit and even at any of her appearances on a book tour if you get the chance. She’s funny and delivers her bits flawlessly; but then go buy the print book. This book qualifies for the Where Are You Reading? Challenge hosted by Sheila at her blog, Book Journey. Unfamiliar Fishes is set in Hawaii. I do believe that Ms Guilianni, my sixth grade Social Studies teacher, is the one who tried to impress upon the class that history was not a bunch of dates and names and battles to be remembered. History was the story of people and The Most They Ever Had is a great example of what my teacher meant. The Most They Ever Had is the story of a community in Jacksonville, Alabama whose economy, whose lives, were predicated on cotton. The Profile cotton mill offered more than jobs for people, it offered them an opportunity to reach for the American Dream. For eighty years, Jacksonville’s destiny revolved around cotton and the mill. Then the mill closed and the world as they knew it, ended. 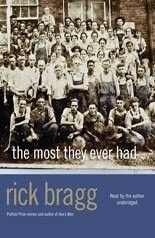 Far from being an affectedly sentimental memoir about his hometown, Rick Bragg narrates his book with affection and candor (and a nice soft Alabamian drawl.) It’s not a ploy for sympathy so much as a nod of recognition towards the proud people who worked hard and, deserved dignity; but whose culture was destroyed in the name of global economics. While the book chronicles the history of the Alabamians who signed on at the Profile, the specific lot of a Southern community, the story is really about a lot of people, including the New England textile workers of the nineteenth and twentieth centuries, the timber and lumber communities of today that stretch from Tunkhannock, PA to Southern Oregon, the citrus grovers from Florida to California and, even Silicon Valley. Just something to think about the next time you go to Wal-Mart and you buy a tee-shirt for $2.99: How much is it really costing you? Other Stuff: I borrowed this book (library edition) from Blackstone Audio, Inc. purely on the qualification that it was set in Alabama. I listened to it as a part of the Where Are you Reading? 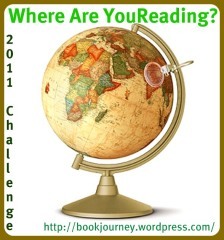 Challenge hosted by Shiela at her blog, Book Journey.